Glenn lost his savings and arrived at the University of Kansas with $7.65 in his pocket. Finally! Glenn Cunningham received his high school diploma. It was 1930 and he was almost 21. For a young man who loved school before he started school, he sure had a tough time getting through twelve years. It did not help that he had been in a schoolhouse fire or his family moved often. No, it didn’t; but he had decided he was going to college. For eight summers he worked and saved money. His earnings also helped his family. He looked for work and found it by cleaning barns, hauling manure, picking up ashes and tin cans in alleys, plucking turkeys, and driving truck. Two summers he worked at a flour mill, often working eighteen hours a day at $9.00 per day. Good pay; and he worked hard, smart, and fast! By his senior year in high school he had earned enough money to attend a good university for four years. He did not predict the crash of the United States Wall Street stock market. Banks began closing. Many people across the country lost their savings, jobs, homes, farms, and ranches. loaned money to friends, former employers, and people who had helped him. Many later repaid him, but not during what became The Great Depression. He lost his savings and arrived at the University of Kansas with $7.65 in his pocket. Many schools had offered him scholarships, which he refused. He did not want to be in debt to any school. The University of Kansas offered him no scholarship, despite his extraordinary potential as a runner. He chose the university. His coaches watched his talent, discipline, and skills with basketball, football, track, and boxing and became interested in helping him. He chose to focus on track, but still there was the problem of his deeply scarred legs. H.W. “Bill” Hargiss, who became Glenn’s track coach, observed, “Both his legs were scarred to the bone, one with scars that reached to his hip….” Great care had to be taken with his legs. His skin and muscles were very tender. The muscles in the scarred areas needed to be developed. Massaging was essential. His training routine helped develop amazing strength and endurance. Sports did not pay his bills. As usual he found jobs, even for other students. He worked at the university stadium, an insurance company, and surprisingly in purchasing cheap sandy land that soon had gas wells. They helped make money for his college expenses. Glenn was an honor student and graduated with the highest academic record in his class. 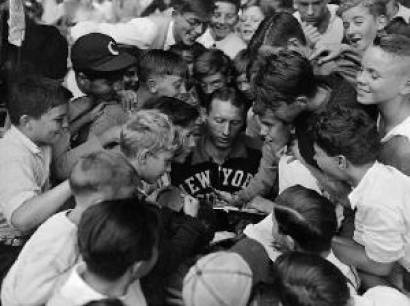 Throughout college and the 1930’s he was busy setting world track records, speaking around the country, and being a student. After retiring from running in 1940 he taught at Cornell College, and then went into the Navy during World War II. Glenn’s achievements and challenges were many, but he readily admitted he made mistakes. He tenaciously lived to be an example. This is Barbara Steiner. I hope you are exploring more stories at thisweeksstory.com.